A meal of ground round patties. Breakfast today was another hearty helping of toast; lunch, minestrone leftovers. Fisher said any good minestrone is better the next day. I came home from work at night tired, hungry, and not at all excited to be on history diet. My ever-present roommate, Jeff, asked me what I was doing for dinner. I told him as long as he didn’t mind eating history food, he was welcome to join me for some ground round steaks. 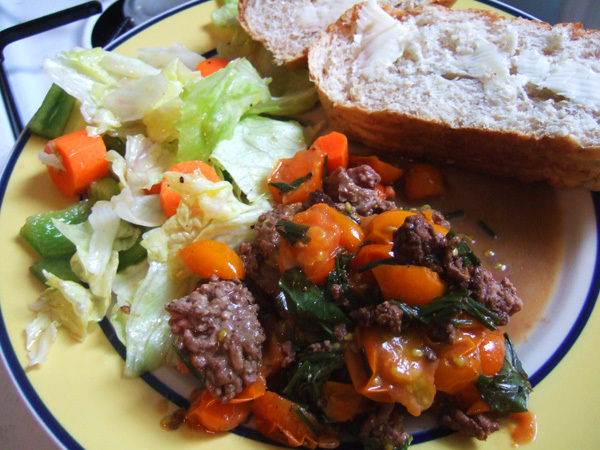 Fisher recommends serving this dish with “hot French bread and a crisp green salad, and a red wine or ale if you can and will.” I set Jeff to work on a salad of fresh lettuce, carrots, and green peppers, while I heated a cast iron skillet until a splash of water sizzled on its surface. This mixture will create a flavorful sauce for the patties. I prepped my ingredients: three large hamburger-style patties of beef and a bowl of chopped chives, parsley, and a healthy glob of butter. Fisher wanted me to add wine, or vegetable stock, or tomato juice to create a sauce for the meat; but I had none of those things in my pantry. 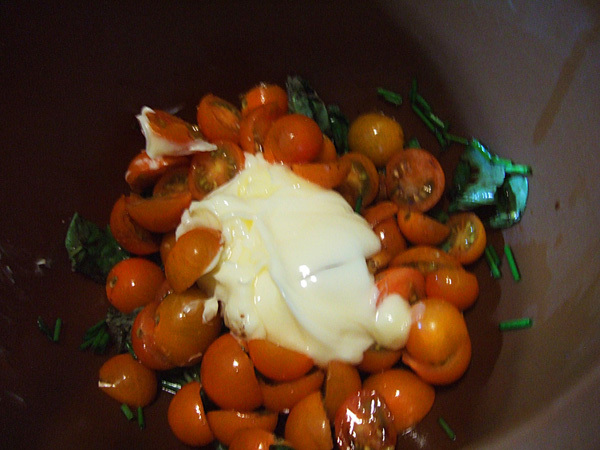 But I did have half a pint of cherry tomatoes, which I halved and added to the herbs, and topped off with a few shakes of Worcestershire sauce (as per Fisher’s suggestion). 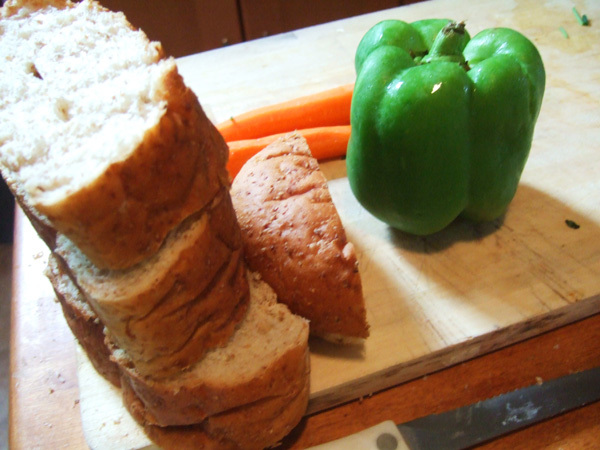 As Jeff and I assembled our ingredients, it made for a cheerful assortment of colors on the kitchen table. Just looking at all the fresh vegetables heartened me and I began to fully understand what Fisher means when she talks about cooking to keep the wolf at bay: a good meal can change your entire outlook on the world, and make you feel safe and accomplished. When the skillet was good and hot, I “Put in the pats of beef. There will be a great smoke and smell, so windows should be open if possible.” I cooked the burgers two minutes on each side, then turned off the heat, added the herb/butter/tomato mixture, and quickly covered the pan. “There will be another great sizzle and fume. Put the cover on quickly, to catch all the first fine savor. In about 50 seconds, stir the mixture thoroughly to catch all the meat-essence in the pan…and put the mixture with a spoon over the cakes of meat.” And so we did, and served up our dinner with thick slices of fresh baked, whole grain bread. Making this dinner was so quick, about 20 minutes from start to finish. We both agreed it tasted delicious; Jeff even went back for seconds, and he is usually apprehensive of History Food. The meat was incredibly flavorful, particularly for such a short cook time. This meal was cheap, easy, and tasty. Eating it put me in a good mood after a long day. Perfect supper, quicker than a fast food detour after work and ten times better… great fun, Sarah!